Based on Margaret Atwood’s dystopian novel, The Handmaid’s Tale tells the story of Offred and her struggle to survive in the oppressive Republic of Gilead. 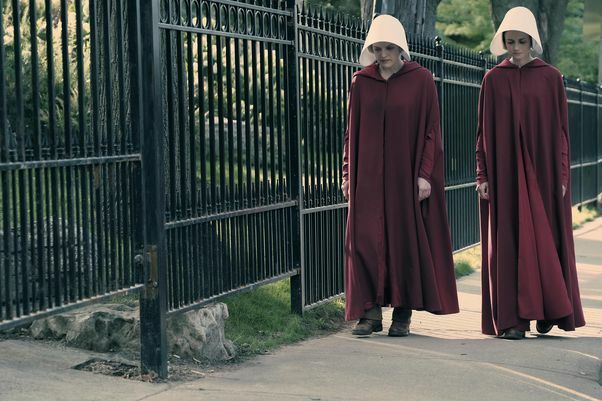 In an alternate reality, fertile women are forced to become ‘Handmaids’ – reproductive surrogates for powerful society leaders and their barren wives. Government spies lurk everywhere. Women don’t control their own bodies. Traitors hang in the streets. It’s difficult viewing – and it should be. State coercion on this level surpasses unsettling and goes straight to nightmarish. The scariest parts of the series are also the most profound: they show how authoritarian regimes are founded upon the progressive removal of rights. Flashbacks depict a time more like our own, but we feel the atmosphere beginning to shift. 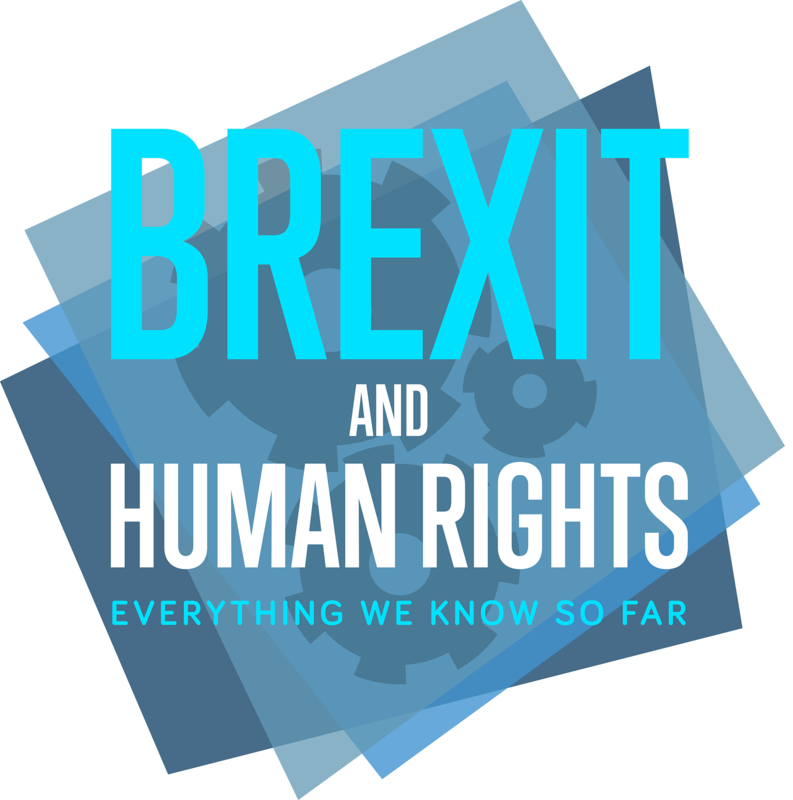 At first, change is slow: rights are gradually eroded in the name of State security – a ‘necessary, temporary’ measure. But it’s not long before this frightening state of affairs becomes the new normal, with many people, especially women, stripped of their basic freedoms. ‘Offred’ isn’t even the main character’s real name; it is given to her by the new order. In the series, her real name is June. Below are a few ways in which the oppressive authorities breach June’s/Offred’s rights. In the flashbacks, we see attitudes towards women begin to deteriorate. The law is changed to make it illegal to employ women, and June loses her job. Women’s bank accounts are suddenly frozen and their assets placed into the control of their male relatives (harking back to the days when women could not legally own property). The streets become so dangerous that June’s husband escorts their friend, Moira, from their flat for her safety. Peaceful enjoyment of property and freedom from gender discrimination are human rights. The flashbacks show that armed officers are increasingly present in public life. In one dramatic scene, a crowd of protestors is demonstrating against the steadily worsening situation when the armed forces open fire. June and Moira are among the crowd, and they run for their lives as heavy-duty weapons are discharged indiscriminately. Freedom of assembly and expression by protest are often suppressed in totalitarian regimes. Forced surrogacy is an horrific violation of the Handmaids’ rights to bodily integrity and reproductive autonomy, which form part of the right to respect for private life. The authorities know that June is fertile because she already has a child. After a daring escape attempt, the State takes June’s daughter from her, which is a gross breach of their right to respect for family life. Discrimination endures after the regime is established, targeting homosexuals. Offred’s friend and fellow Handmaid, Ofglen, and Ofglen’s girlfriend are convicted as ‘gender traitors’ and severely punished. Ofglen’s life is spared because she is fertile, but her girlfriend is hanged. Sexual orientation discrimination violates human rights. In the new regime, Offred must beware of the ‘Eyes’: government spies who secretly watch and listen for traitors. Initially, everything Offred says to Ofglen is guarded; neither knows whether it is safe to trust the other. Talk about certain concepts, like male sterility, is forbidden. 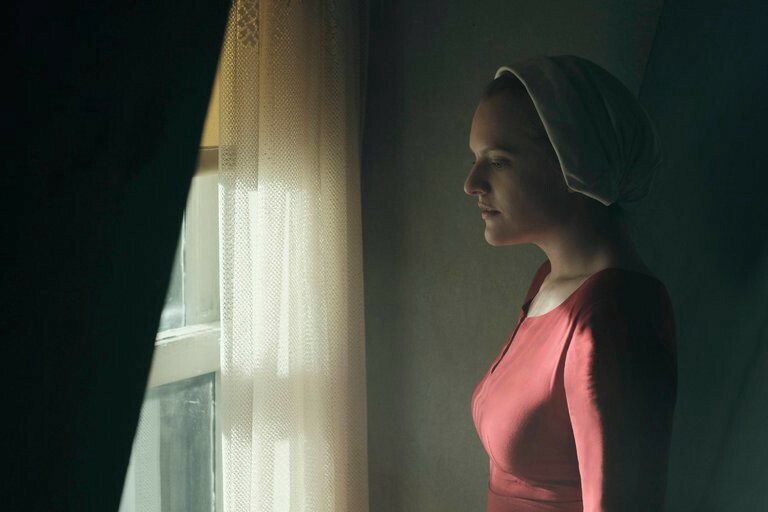 Offred is beaten for saying the word ‘gay.’ State surveillance endangers the right to privacy and enforced taboos threaten freedom of speech. The Handmaids are prisoners of the State. They are denied the right to liberty and security of person. 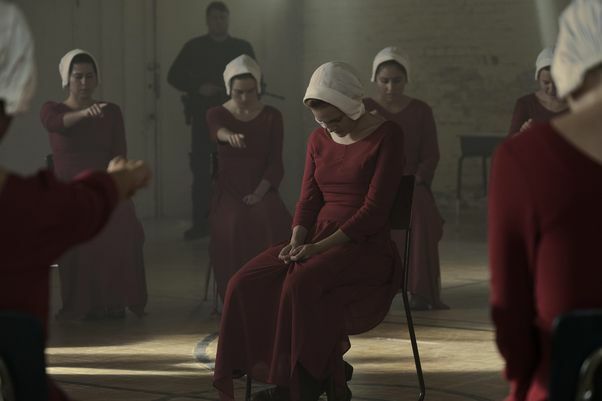 In ‘training’ to adjust to their new lives, the Handmaids are threatened with violence and physically abused if they do not submit to the new order. The wife of Offred’s Commander is often cruel to Offred. At times, it seems that Offred’s plight might break her spirit. 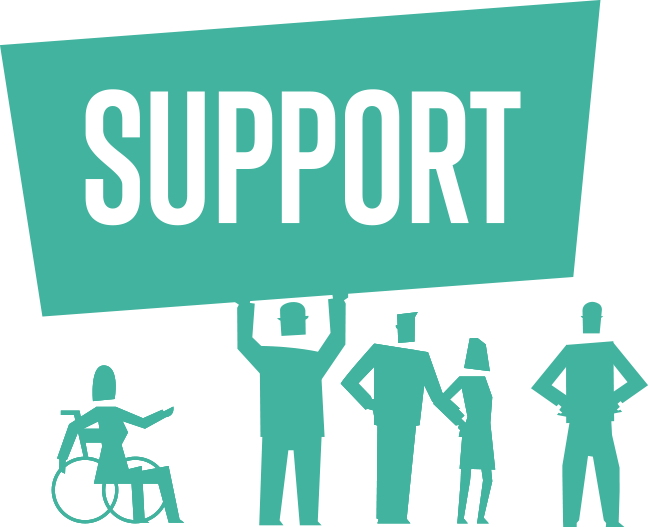 Severe physical and psychological abuse can amount to inhuman and degrading treatment or torture. For all the misery, The Handmaid’s Tale is really a story of defiance and empowerment. It’s important to think how disturbing such an alternate reality would be, but several themes, running subtly through the series, signal the antidote to oppression. We glimpse them first when June decides she will not be broken by the regime. We see them again in June’s determination to reunite with her daughter. And we sense them in the Handmaids’ silent gestures of solidarity, from which June draws strength. These acts are beacons of unity, courage and hope. In our world, such concepts find expression in human rights laws. Handmaid’s Tale Art Exhibition image: Garrett Ziegler / Flickr. 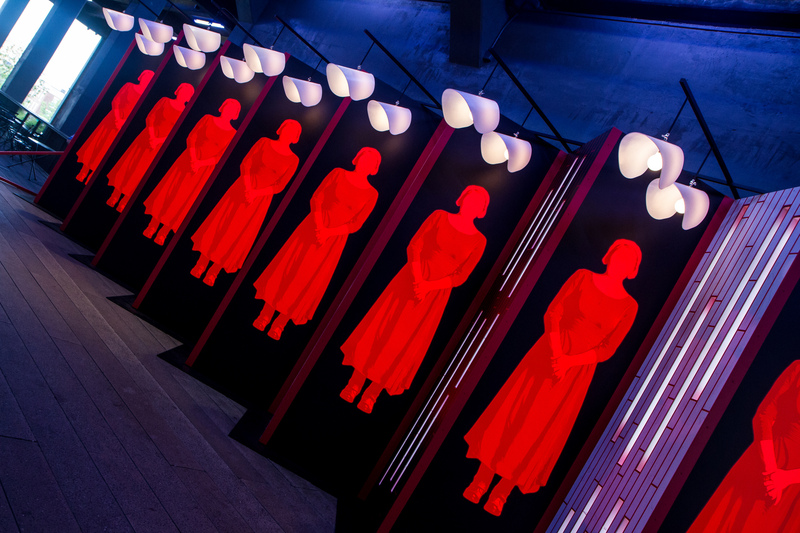 Other images: Channel 4 Press Pack / The Handmaid’s Tale – MGM/Hulu.